This entry was posted in Christmas Cards and tagged Christmas cards, Merry Christmas, thank you by pilch92. Bookmark the permalink. We are blessed to have friends like you, too! Merry Christmas! THose are all lovely cards. But its too many pictures fer us to download. Some just stay blank after 20 minutes.. Sorry about that. Thanks for trying. Sorry about that, I need to learn how to set up a slide show. Love the Xmas cards! They’re great! Thanks for visiting my blog over the past year and leaving a comment. It means a lot to me. Merry Christmas to you, your family and all the cats! So are you 🙂 Merry Christmas! I love these! My eCard will be up sometime today. Thank you, I will go grab your card. I looked to see if you had one because I noticed I didn’t have one, good to know I didn’t miss it. Wow, you got a lot of wonderful Christmas cards!! Merry Christmas and thank you for becoming our friends! Thank you for your friendship. Merry Christmas. They are all lovely cards! Oh my what BEAUTIFUL cards…………………we hope that all of you have a REALLY fabulous Christmas with lots of presents, hugs, and food! Thank you for your friendship – one of the greatest gifts of all……………. Thank you for your friendship too, it is a wonderful gift. I hope you have a wonderful Christmas- with added bacon. XO and lots of love. You sure received a lot of fabulous cards. Merry Christmas to you! These cards are all so beautiful! 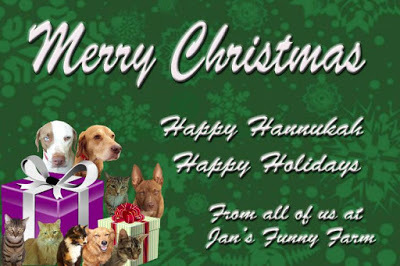 Ellen and kitties, we hope you had a happy Hanukkah, and that you have a very merry Christmas and a blessed New Year! Thank you for your friendship! Thank you. I hoe you have a wonderful Christmas and a Happy, Healthy 2016! I thank you for your friendship too. We love all the cards we got too! Meowy Christmas Eve! Thank you 🙂 Merry Christmas eve to you too! We loved looking at all your lovely cards Thank you for sharing. Merry Christmas from the Ryan family. These are just awesome! Merry Christmas, Ellen, Dad and all kitties!! Thank you and Merry Christmas to you all too! Snowball sends a kiss to Pierrot. You have lots of lovely cards. I can see my snail mail card on the table! I am showing my snail mail cards on tomorrow’s post. The cards are beautiful!!! I especially love the photo with my sweetheart, Penny. I meant to get mom to send a treat to her but we were distracted by other events. But there’s always Valentine’s Day!!! We love you all and wish you a Merry Christmas. We just love looking at all of our friends’ Christmas cards! Wowzers! Look at all those cards! Mes gots some more, but alas, mes don’t thinks that Mommy will gets more up. too many things to do what with Santa (and my human brother) coming tonight. So happy to call you all friends! Have a very merry Christmas. We are thankful for your friendship. Have a wonderful Christmas! We are so glad to have y’all in our lives. Merry Christmas. Great cards! Did you get ours? If not, please stop by our blog to pick one up (if you want). Christmas hugs and headbonks to you all! Merry Christmas. What lovely pictures you have with Santa. That was great and so nice to have a Santa available to get a picture with. Meowy Christmas! Such lovely pictures. And thank you so much for posting Guero’s badge… him am still having trubbles… just like Brian of Brian’s Home – Him having Pee Wars… and we pray the Guero wins. He had to go back to the vet yeasterday to have his bladder expressed. And he will have to go to vet on Monday for more shots… Purrz from Katie Kat, Sivlia (Guero’s Mom) and Guero. Oreo helping Mom type… mol. Merry Christmas! Pee wars are awful things, I am praying he wins. 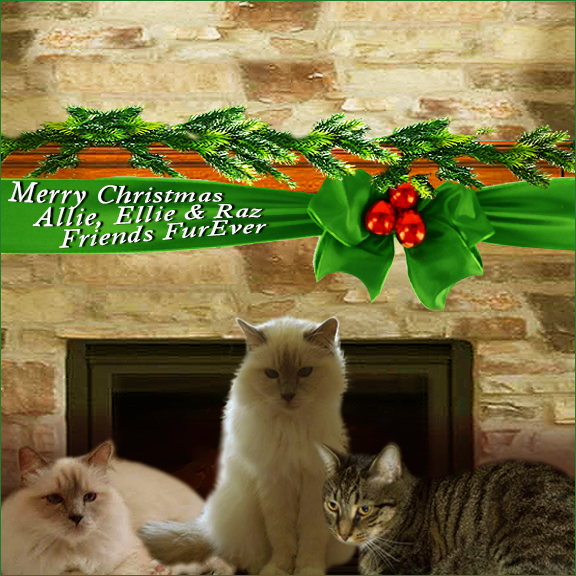 So-o many beeuteefull cardss there Lady Ellen an Phoebe mee buttercup gurl……. Wishin youss a berry Merry Katmass…. We are blessed to have so many friends. Yours wasn’t visible because Phoebe has it in her area where she has her bulletin board and book of poems, etc. She needs her own room. XOXOX and love to you both from Phoebe and her Mom. Mee needs mee own room all so! Today wee gotted anew TeeVee stand an now mee foto of Phoebe has diss a peered…..mee asked LadyMum to get it out of the piles of cards an put it bye mee toy baskit….mee wants to see mee precious kittygurl’ss foto efurry day!!! Xcuse mee….mee has to go holler at LadyMum!!!!! Oh no! I hope your Mum can find the photo so we can be together for New Year’s Eve and kiss at midnight- I will kiss your photo as the clock strikes midnight my sweet. XO paw kisses and nose kisses too. You are very romantic, my sweet. XOXOXOX paw kisses and nose kisses to you too. I will adore and love you forever too. PepiSmartDog: Merry Xmas and Happy New Year! WOW – what a fantastic assortment of cards!! Thank you, we are blessed to have so many friends. Happy 2016 to you too! We will be hopping with you. Mee just *nose kissed* yur foto! Mee iss dreemin of you mee sweet gurl an watchin thee snow fall an wishin wee werecuddlin on mee new Sherpa blankit together!